Ground War explores the transformative technological advances that have defined battlefield combat through the ages. From the gladius to the AK-47, from the chariot to the tank, from the trebuchet to the howitzer, and from the battle ramp to the star fort, the series follows the fascinating punch and counterpunch of battle tactics and new technologies. With classic examples like the stirrup and lesser known innovations like the gunner’s quadrant, the series reveals how even the smallest innovations can have a wide-ranging effect on the way wars are fought. Individual episodes explore the development of the soldier and his weapons in Warrior Weapons, movement in the combat zone in Battlefield Mobility, the evolution of artillery in Firepower, and battlefield engineering in Command and Control. Ground War joins Warship and Warplane, as the final chapter in the critically-acclaimed science and history trilogy that showcases the technological evolution of combat. To help viewers better understand the mechanics of the innovations explored, the series features instructive (and often explosive) modern-day testing, and a rich arsenal of descriptive graphics, archival footage, and expert interviews. Warrior Weapons traces the evolution of soldiers and their gear. From the phalanx formations of Alexander the Great to the gladiuses of the Romans and the longbows of the English, the film starts in a world without gunpowder, than examines the transformative arrival of the explosive elixir, and the matchlock and flintlock muskets, rifled barrels, expanding bullets, automatic weapons, and assault rifles that followed. On the defensive side, we see how personal armor evolved, became outdated, then returned with the arrival of Kevlar and ceramic composites. And looking towards the future, we see the development of wearable exoskeletons that will one day soon make human soldiers stronger and faster, and advanced robotic soldiers that may one day replace them completely. Battlefield Mobility explores mobility on the battlefield, and the never-ending challenge to maximize effectiveness and find the right balance of protective armor, speed, mobility and firepower. The nimble Egyptian chariots led the way as an effective firing platform. The stirrup and selective breeding turned the horse into a true weapon of war and set the stage for the mounted knight as a self-contained mobile battle-system. And then came the tanks, which evolved from the first British efforts in World War I with boxy Little Willie and hulking Big Willie, to the fast German Panzers and powerful Russian T-34s of World War II, to today’s heavily armed and armored machines like the American Abrams, which comes complete with massive gun, sloping, explosive reactive armor, thermal sights and even stealth coatings. Firepower tracks the development of artillery from the ancient Greeks, through the invention of gunpowder in China, to the very latest generation of big guns and directed-energy weapons. Throughout the ages, the ability to strike from a distance has been critical to success in battle, and time and again, artillery weapons have forced armies to adjust to ever-more powerful technology. Starting with the Greek gastrophetes—a tension- powered mechanical bow, artillery evolved into the torsion-powered Roman ballista, and then the massive counterweight trebuchet, which was used to toss everything from rocks and fireballs to severed heads and whole people. But once again, it was the arrival of gunpowder that truly transformed artillery warfare. The marriage of gunpowder and barrel sparked a revolution in every aspect of firearms design. From bamboo, iron, bronze and then steel barrels, to changes in the formulation of the gunpowder itself, to elongated, spinning projectiles, to advanced recoil mechanisms and special tools and calculations for aiming, every generation built on the previous to create ever-more-accurate, far-reaching and deadly big guns. Command and Control considers the ways in which armies have used or modified the terrain of the battlefield to their advantage for both defense and attack. From Hadrian’s Wall and the Great Wall of China, to the mountain fortress of Masada and the great ramp the Romans built to conquer it, to the rooftops and alleyways of Baghdad, battlefield engineers have worked creatively for thousands of years to make their landscapes work for them. Massive Crusader castles like Krak des Chevaliers, with its multiple walls and concentric layers of defenses, provided “defense in depth,” as did later features like bastions, star forts, moats, and earth-backed walls. But offense too benefited from battlefield engineering, as soldiers tunneled under enemy lines, dug complicated systems of trenches, and used barbed wire to funnel enemies into deadly killing zones. Even in today’s conflicts, the shovel remains a staple of battlefield gear, and the manipulation of the conflict zone can be the difference between victory and deadly defeat. 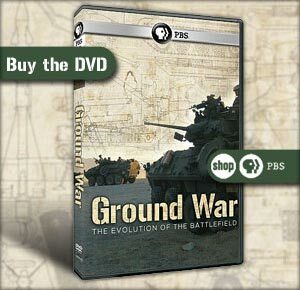 Ground War is a presentation of THIRTEEN in association with WNET.ORG. The series is narrated by R. J. Alison. Warrior Weapons and Battlefield Mobility were produced and directed by Roger Finnigan. Firepower and Command and Control were produced and directed by James Millar. Liz McLeod is executive producer for Granada. At THIRTEEN, Jared Lipworth is executive producer. William R. Grant is executive-in-charge. Funding for Ground War was provided by the Alfred P. Sloan Foundation and by PBS.